Pawn your Omega Watch! We offer Loans on Omega Watches! Liquidating the value of an asset to secure temporary funds can be straightforward, particularly for anyone exploring the possibility of how to “pawn my Omega Watch in London”. Issuing loans on Omega watch pieces at our award winning shop in Central London is one of the areas of specialism we offer, as part of our highly confidential service from our London pawnbrokers office. We make it effortless and highly discreet to release the value of your Omega luxury watch to meet pressing financial needs. Experts at New Bond Street Pawnbrokers allow you to ultimately retain ownership of your luxury item, while offering you an authentic assessment of its worth. The process involved is swift and simple. It is described here though we are also happy to talk you through how our high-value pawnbroking service operates. Our expertise and our personal approach to customer service are both available from your initial private appointment for your Omega watch appraisal, right through to when we assist you to reacquire your item. The interest charged within this confidential arrangement makes the option of pawning your Omega luxury watch affordable, as well as effortless. 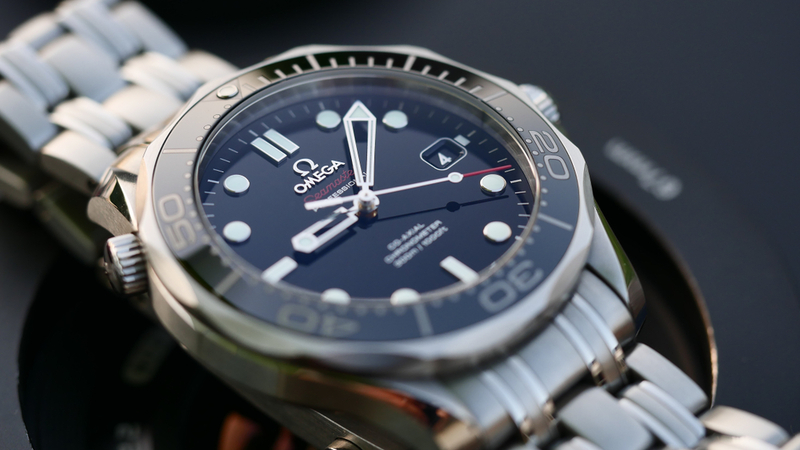 Why would you opt to take loans on your Omega watches, as opposed to selling it? Clearly, items from Omega’s top collections can command high prices when resold. Omega has been a respected name in the watch sector for more than 160 years, gracing the wrists of world leaders, intrepid explorers, discerning celebrities and anyone else who seeks cutting edge design and reliable functioning. It is a luxury watch brand that has risen to global fame, since its humble beginnings in a tiny workshop run by Louis Brandt in Switzerland in 1848. In 1885, the founder’s sons introduced the firm’s first mass-produced item, the Labrador. Experts believe the company’s reputation was first cemented by the launch of the 19-line Omega Caliber in 1894. One of the brand’s most sought-after collections is the Omega Seamaster range. First launched in 1948, it is the luxury watch brand many diving enthusiasts use, though it also has universal fashion appeal. Other Omega collections that are aspirational for anyone who values style and technical excellence in a luxury watch include Speedmaster, Constellation, De Ville, Dark Side of the Moon, Tesor and Globemaster. These are luxury timepieces that have become the highlight of high-value auctions the world over. Omega is the official timekeeper for the Olympic Games, and has been for over 20 such events. Recently, a 2017 Omega Speedmaster Speedy Tuesday came up for auction at a UK auction house – Barnebys. It had an estimated purchase price of over $5,700. An Omega watch belonging to Elvis Presley (gifted by his label to celebrate his milestone of selling 75 million records) sold for over $1.8m at an auction in Geneva. However, it could well be that you are loathe to part with your own Omega luxury watch on a permanent basis. Selling such an item can be hard, particularly if your Omega wristwatch was a gift or was purchased in celebration of our own milestone achievement. Securing a loan on Omega watches is a way to solve temporary money needs, without having to permanently dispose of such a valued asset.